This post is part of an ongoing series where I practically walk through important calculations, metrics and unit economics for consumer internet businesses. Today, we discuss retention and LTV. Cohort retention is basically the number of customers retained in any given cohort. 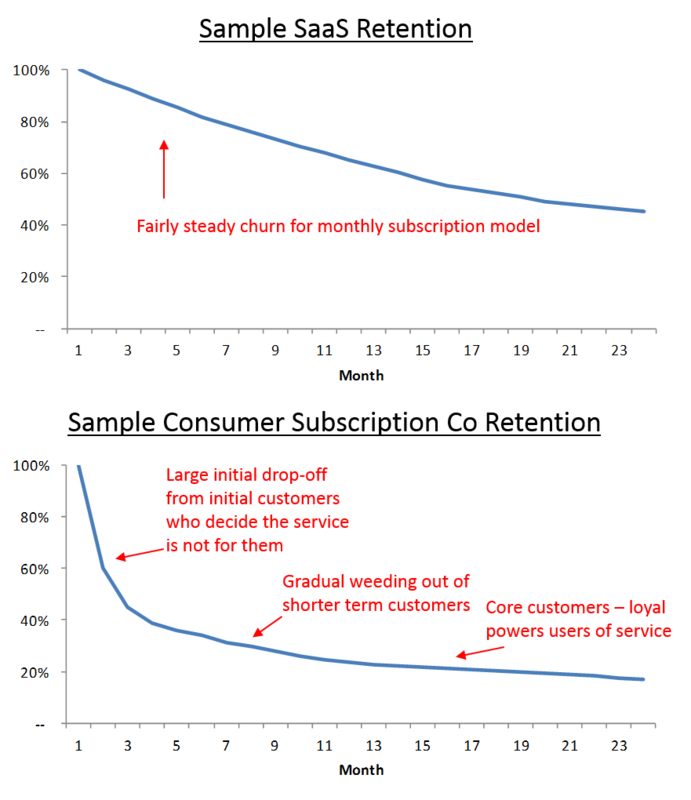 While most SaaS businesses tend to have fairly linear retention curves (depending on their pricing model) with a small amount of churn each month (figure 1), consumer businesses can be quite erratic (figure 2). Using a consumer subscription company as an example, you might see a huge initial dropoff in a cohort of customers, followed by steady churn over time that quickly levels out. Retention curves for earlier cohorts may also perform very differently from later cohorts as the product or service changes (figure 3), or as different types of customers are acquired. When looking at customer retention data, it's also important to make sure that metrics are being compared consistently. It's great to look at retention data for "ACTIVE customers", or some other segment of customers, but to get a broad sense of what is really going on it's important to also look at AGGREGATE customer cohorts. If you were to acquire 1,000 customers, you should see how those 1,000 customers behave over time. From there, it's easy to drill down into different customer segments. A quick proxy for your LTV curve can be created by simply inverting your retention curve. Look at a particular month on your retention curve, find out how many customers that is, and then multiply that by the average transaction value to see how much revenue was generated by that cohort in that month. Accumulate these values over several months and then you begin to see what LTV looks like. After you tally up your LTV values, the next step is to put it all together in a way that makes sense. This is where things become more art than science. 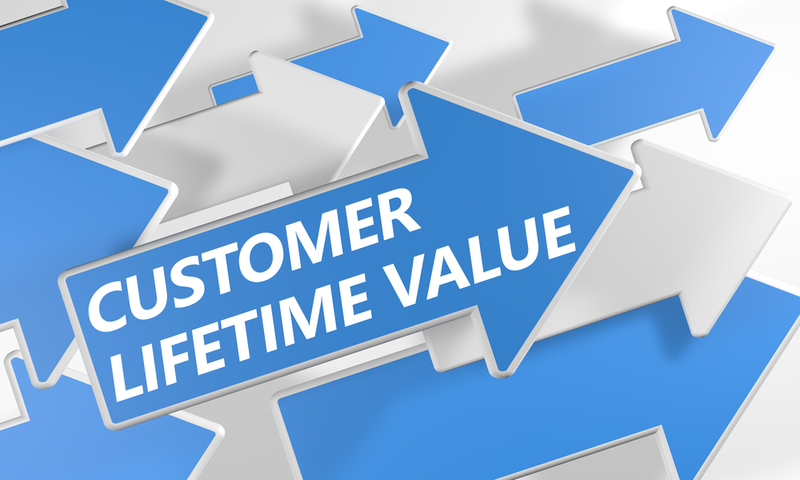 If you only have a few months of customer data, it becomes difficult to bet on a 2-year, or 3-year life of a customer. The most conservative way to look at LTV is to only look at OBSERVED LTV to date, that is, historical data. Many companies, particularly ones with less historical data, extrapolate LTV based on what they THINK their retention curves will look like. As you would expect, these are often over-inflated as it's notoriously hard to predict how consumers will behave several years out. In scenarios like this, I tend to cap the time period I'm thinking about to 12 months or 24 months based on how much conviction I can develop through studying other aspects of the business. Hence, my recommendation is to pick a few time periods and look at the cumulative LTV at each point, say 3-month, 6-month, 12-month, and 24-month LTV values. If you have 6 months of historical data, then you can feel pretty good about your 3-month and 6-month LTV while having good insight into your 12-month LTV and at least an educated guess for your 24-month LTV. In the above example, the sample consumer company is paying back their customer acquisition spend after 4-5 months on a contribution basis. After about 2 years, it achieves 2.7x payback on customer acquisition spend. However, this analysis is only the beginning in understanding your business. The final step, once you have your LTV values at various time periods, is to understand your metrics relative to comparable benchmarks. If you are a flash sales ecommerce business, you will want to know how your 6-month and 12-month LTVs stack up to OTHER flash sales businesses such as Zulily or Gilt. 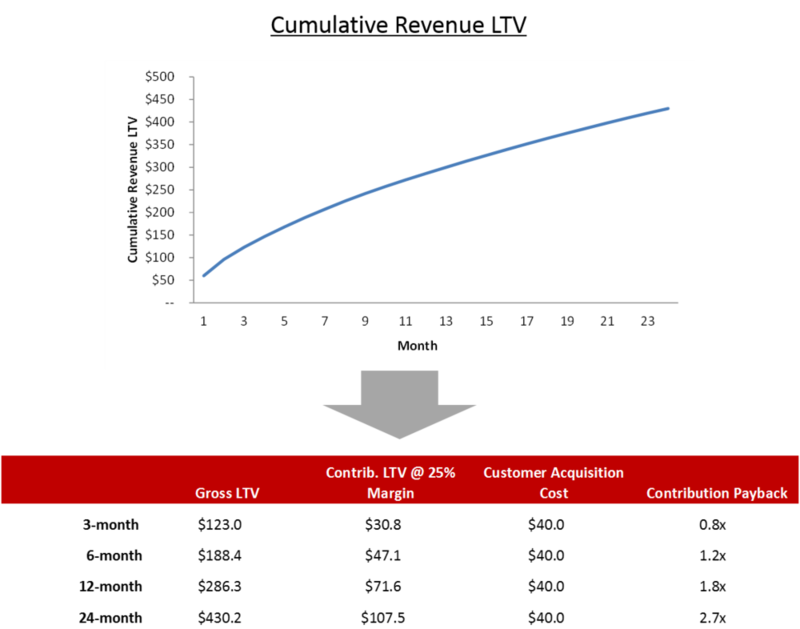 There are MANY variations and nuances when it comes to LTV curves, LTV/CAC, marketing payback. etc. Stay tuned for an upcoming post where I dive into more detail on these topics.